You are at:Home»Hotel Industry Trends»What’s Happening with Rate Parity in the Hotel Industry? Recent developments in legislation throughout the world have made rate parity an important topic in the hospitality industry. But despite its frequent appearance in the news, rate parity remains a complicated issue, and one that takes a different form from one market to the next. To understand what exactly is happening with rate parity in the greater hotel industry, our researchers examined it on a global scale. Presented here, their findings offer a comprehensive look at rate parity from its origins to its current legal status in countries around the world. Rate parity is a legal agreement between hotels and online travel agencies (OTAs) in which the hotel guarantees to use the same rate and terms for a specific room type, regardless of the distribution channel. The price of the room can regularly change – which means the exact rate is flexible – but it must always remain the same across all distribution channels, both direct and indirect. While the specific terms of each rate parity agreement vary depending on the country and parties involved, there are two broad categories: wide rate parity and narrow rate parity. Wide rate parity is the more restrictive form of parity agreement. In such clauses, a hotel agrees not to undercut the room prices that the OTA charges for their hotel. This agreement generally applies to all distribution channels, including other OTAs and the hotel’s own website. Narrow rate parity developed in response to intervention from regulators in Europe. Such clauses generally allow hotels to offer lower rates to other OTAs, but not publicly online through their own websites. Narrow rate parity clauses also generally don’t restrict the hotel from offering lower direct rates when it’s through indirect or offline channels, such as email or telephone bookings, or to guests in their loyalty programs. How did rate parity first come about? Franchisers of hotel chains were the first to use online rate parity agreements to prevent third parties from advertising lower rates than what the chains were offering. Later, as hoteliers began to have different prices per room type, OTAs began introducing rate parity into their negotiations with hotels. How have hoteliers adapted to rate parity? Monitoring the rates published for the property across all online distribution channels with a rate shopper, such as the Rate Insights tool in trivago Hotel Manager PRO. Publishing direct website rates alongside the OTA rates on metasearch sites. While the hotel’s official website rates and the rates advertised by OTAs remain in parity, travelers can choose to complete their booking on the hotel’s website. On trivago, for example, the expert feature Rate Connect places a hotel’s official website rates in a blue box at the top of the list of deals on their hotel profile, where it will have greater visibility and resonate with the travelers who prefer to book direct. Packaging additional amenities such as free Wi-Fi or a complimentary breakfast to increase the value for the traveler who books directly, and advertising these deals on their hotel profiles In such cases the hotel’s rates are not lower than the OTAs’, but the perceived value of the guest experience they are able to offer at the hotel is visibly higher. Promoting private rates through customer loyalty programs, direct marketing email campaigns, or register-only travel providers. With this approach, hotels encourage both direct bookings and brand loyalty. Listing certain room types exclusively on the hotel website, so that those room rates are not subject to rate parity agreements with OTAs. It’s the hotels with optimized, integrated booking engines that are in the best position to employ this method. What’s the status of rate parity? The current hotel distribution landscape is a global patchwork of regulations of rate parity clauses and OTA behaviors. 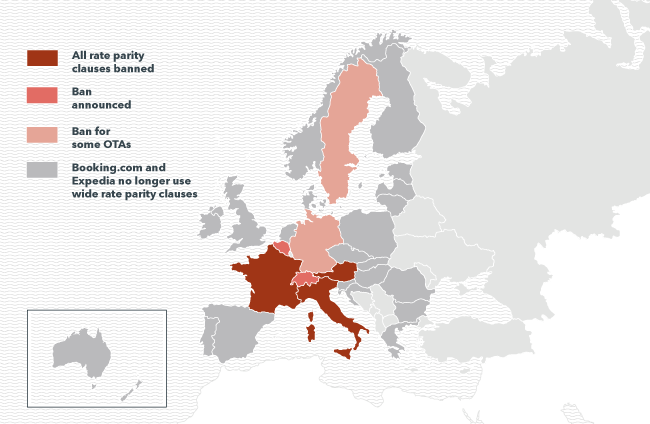 In Europe, several national jurisdictions (France, Austria, Italy, and Belgium) prohibit all OTA parity clauses outright, while another, Switzerland, has announced concrete plans to follow suit. In Germany and Sweden regulation only applies to certain OTAs (HRS and Booking.com in Germany, and Booking.com in Sweden), while other OTAs continue to use wide and narrow rate parity clauses within these markets. In Australia, New Zealand, and the European Union, Booking.com and Expedia have, in agreement with regulators, adopted only narrow rate parity clauses. In other major markets, however, these OTAs continue to use wide rate parity clauses. Some smaller OTAs continue to use wide parity clauses across all markets, except where they are banned. 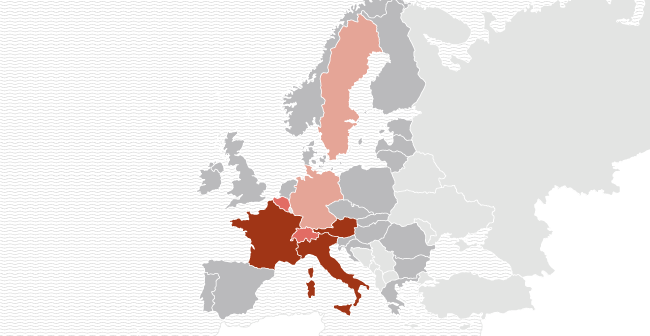 France – July 2015 – The “Macron Law,” which outlawed all rate parity clauses, was adopted in July 2015. Austria – November 2016 – Austria amended the Competition Law to outlaw all rate parity clauses in November 2016. Italy – August 2017 – The Competition and Market Law, which outlawed all rate parity clauses, was adopted in August 2017. Belgium – November 2017 – The Council of Ministers adopted the draft law of the Consumer Affairs Minister, allowing hotels to freely publish their own rates on their websites. Hotels are now no longer bound by price agreements with popular booking sites such as Booking.com. Germany – December 2013 – The Federal Competition Authorities prohibited all parity clause used by HRS, a major German OTA. December 2015 – The Federal Competition Authorities ordered Booking.com to remove all rate parity clauses from its contracts before January 31, 2016. A temporary injunction in May 2016 by Booking.com was unsuccessful; the decision remains in force, though a full appeal is still pending. Sweden – July 2018 – Stockholm’s Patent and Markets Court prohibited Booking.com from using narrow rate parity clauses. This extended a 2015 decision from Sweden’s Competition Authority which had barred Booking.com from using wide rate parity clauses. The company was given three months to comply. 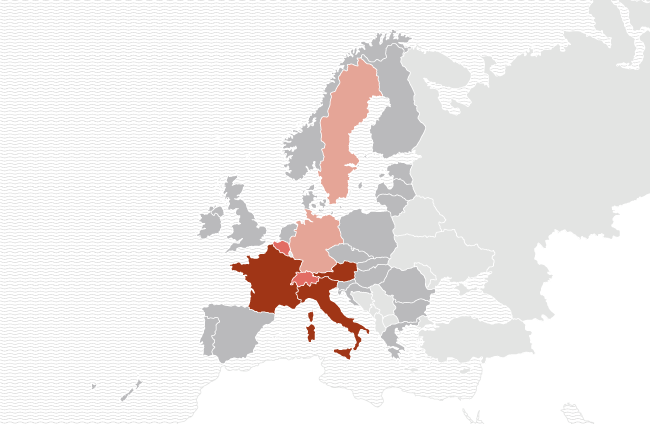 European Union – June to July 2015 – In agreement with regulators in Italy, Sweden, and France, Booking.com changed its rate parity clauses in Europe from wide to narrow at the end of June 2015. Expedia followed suit shortly thereafter at the beginning of July 2015. Australia – September 2016 – Expedia and Booking.com agreed to amend their contracts from wide to narrow rate parity clauses, after an investigation by the Australia consumer watchdog. New Zealand – October 2016 – Expedia and Booking.com subsequently agreed to amend price and availability clauses to be in line with their approach in Europe and Australia. Switzerland – September 2017 – A motion was passed in both houses of the Swiss parliament to ban rate parity agreements. Though the motion was not supported by the government, it did have a large majority in the parliament. The government has two years from the time the motion was passed to draft a law to implement the proposal. USA – In the USA, no uniform regulation of rate parity clauses has emerged. In February 2014, a significant antitrust case against 22 travel brands including Marriott, Expedia, and Priceline was dismissed, which reduced pressure for regulation in the country. Several new accounting standards that impact the hotel industry came into effect in the US in January 2018. While these standards do not touch on price parity regulations in the country, they will require hotels to more transparently record costs associated with merchant model OTA bookings. Latin America – Rate parity clauses are widespread and not specifically regulated in Latin American countries. Though not an exhaustive list of all the countries currently facing and adapting to changes in OTA behavior and legal proceedings regarding rate parity, this research on major global markets does reveal that rate parity is clearly a thing of the past in some areas of the world and on shaky legal ground in others. And while in some countries rate parity appears safe for the time being, we’ve likely not heard the last news on what’s allowed and what’s prohibited in the complex contractual relationships between OTAs and hotels. Article was originally published October 2017 and most recently updated March 2019. A version of this article was published in April 2018. This is an excellent article about rate parity for someone who wants to know what is rate parity and how it is working in the hotel industry. The article has also information regarding in which countries it is available and in which countries it is now available. So, you get the information that it is available in your country or not. Great Work!